According to a 2006 Institute of Medicine report, about 1.5 million preventable medication errors are made each year. Prescription drugs are a double-edge sword. They can treat and manage diseases, making it possible to lead a better life. But if you take them incorrectly, forget to take them, or take them with other drugs that could diminish or exaggerate their effect, there could be serious and dangerous consequences. More than 500,000 Americans misinterpret instructions on a prescription drug label every year, leading to millions of needless hospital admissions and emergency room visits. Details of what is on the label, other than the patient’s name and dosage instructions, vary by state. You may be sent home with pages upon pages of instructions and warnings about the drug you are taking. This is helpful information if you read it, but the print may too small or the language too technical to interpret, so most people rely solely on the information printed on the label. That’s why it’s helpful to have easy-to-read and easy-to-understand labels. Some pharmacies have tried to help consumers. For example, triangular containers that stand on their caps leave a wide area on the front and back for information in large typeface, including multiple warnings and instructions. There may also be a color-coded system that makes it easier for family members to distinguish one person’s medication from another’s. How can you protect yourself against errors? Here are some Things to Look For in a Prescription Medication Label, from some authorities that set standards for prescription medications – the U.S. Pharmacopeia and the Institute for Safe Medicine Practices. You may be able to find a pharmacy that adheres to some of their suggestions. Drug information is typed in easy-to-read 12-point type, about the size of which you see here. Your name, drug name, and drug instructions should be included in the largest type. Warnings typed directly onto patient labels in large typeface. The colorful warning stickers that sometimes appear on the sides of the bottle are read by fewer than 10 percent of people, according to research. Both the generic and brand name of the drug need to be listed. This will help you know if you have been prescribed the same drug from two different doctors; one who prescribed the brand name and one who prescribed the generic version. Images or physical descriptions of the pills in the container. It’s easy to spot a mistake if you see a picture of a round white pill, but inside the bottle you see an oval-shaped blue one. No extra zeroes. This means that 5 mg of a medication should not be written as “5.0.” This could lead to a patient mistakenly remembering the dosage as 50 mg instead of 5 mg.
Reading and understanding your medication labels can help you successfully manage your health. and seems to eat whatever they want? Oh, they’re just lucky, you think. Or they have the right genes or a fast metabolism. My suspicion? It’s not luck, they work at it. They pay attention. No one can really eat whatever and whenever they want. It’s not healthy. People need to eat the highest quality, healthy food in the right amount and at the right time. It’s important not to confuse the words portions and servings. A portion is the amount of food you put on your plate. A serving? That’s the specific amount of food defined by common measurements (like cups or tablespoons). But if you regularly take large portions, you may be getting more than you bargain for: the serving size climbs (sometimes to unknown and unexpected levels), resulting in too many calories and too much fat. The end result is unwanted weight gain. Simply put, portion control is limiting what you eat; being aware of how much food you are actually consuming. With a little practice, it’s easy to do. So we came up with 5 Steps to Portion Control. Measure accurately. Keep your measuring cups, tablespoon and teaspoons handy – and use them. Learn what sizes mean. Associate common objects with serving sizes: a deck of cards is approximately a 3-ounce serving of cooked meat, fish or poultry; a half-cup is the size of an ice cream scoop; one cup is the size of a tennis ball; a 1-ounce piece of cheese is the size of a domino; one vegetable serving is about the size of a baseball. When eating out, take out. 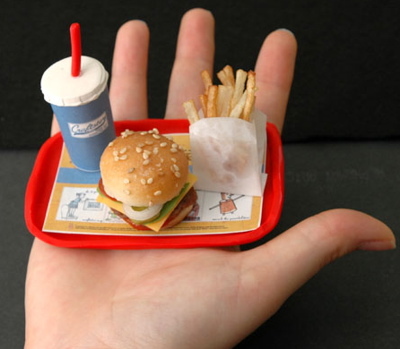 Restaurants are notorious for serving large amounts of food that go way over the recommended serving sizes. To prevent temptation to eat it all, ask for a container when your food comes, then scoop half of it into the container and take it home. Not only will you be eating a more reasonable portion size, you won’t have to cook the following night! Or if you like, order one entre for two of you, share it with your spouse or friend. Many restaurants will bring the entre on two plates already split in half for you, and these days, it’s usually plenty of food. Watch your plate (size). It’s easy to fill up a plate and eat mindlessly. Instead of filling up a standard 12-inch dinner plate, swap it for a smaller, 8-or-9-inch plate. Or, if you don’t have a smaller plate available, divide your large plate in half, filling up one half with vegetables; then divide the other half in half again and use one-half for your protein source and the other half for your starchy foods or carbohydrates. Don’t eat out of the bag. Rather than sitting with that bag of popcorn (it’s low-fat, you think, so it’s safe, right? ), measure out a serving and put it in a pretty bowl, then dig in and enjoy. You won’t eat until the bag is empty; chances are you’ll slow down and savor what’s in the bowl and be satisfied to leave the bag in the pantry for tomorrow’s treat.